Diagrams 2018 will be held in Edinburgh, at Edinburgh Napier University’s Sighthill Campus. All conference sessions, workshops and tutorials will be held on this campus. 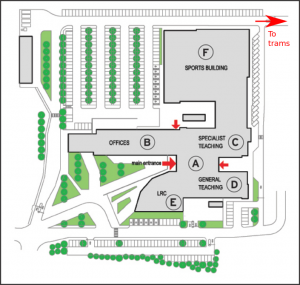 The overnight accommodation offered to delegates is a tram ride away from the Sighthill Campus. The conference dinner will be held at Murrayfield Stadium with more details provided below. Edinburgh has a good tram service which is recommended for travel around the city. Tickets should be purchased before getting on the tram. All tram stops have ticket machines which accept cash or card payment. Located close to one of the city’s tram stops, the Sighthill Campus is easily accessible from both the city centre and airport. The easiest way to get to the conference venue is from the Bankhead tram stop. After disembarking the tram at Bankhead, walk south down Bankhead Avenue. Walk through the entrance to Edinburgh College: the Sighthill campus of Edinburgh Napier University is behind the college. The postcode of the campus is EH11 4BN. Centrally located, ensuite accommodation will be available to delegates for £45 per night, within walking distance of Haymarket train station and tram stops. This accommodation is in the Orwell Terrace halls of residence of Edinburgh Napier University and can be booked during the registration process. The accommodation reception is open from 09:00 to 19:00 each day. Rooms are available for check-in from 15:00. Check-out is by 10:00 on the day of departure. Outside of reception hours, security staff are available to check-in late arrivals. It will assist greatly with organisation if those expecting to arrive late, after 19:00, could email p.chapman ‘@’ napier.ac.uk with an expected arrival time. The postcode for directions is EH11 2DT. Prior to check-in or after check-out, luggage can be stored at the main conference venue (Sighthill Campus). Please enquire at the registration desk if you wish to make use of this facility. From the airport, take the tram to Haymarket. Alternatively, take the 100 Airport bus, and alight at Haymarket. From Haymarket, walk south-west down Dalry Road until you reach Orwell Terrace, on the left. A taxi from the airport to Orwell Terrace will cost approximately £30. From Edinburgh Waverley, take a short train journey to Haymarket. Alternatively, take the tram from Princes Street to Haymarket, or the 100 Airport bus to Haymarket. From Haymarket, walk south-west down Dalry Road until you reach Orwell Terrace, on the left. A taxi from Edinburgh Waverley to Orwell Terrace will cost approximately £15. The conference dinner, held jointly with ICCS, will take place at the BT Murrayfield Stadium in the President’s Suite. Murrayfield is the home of Scottish Rugby and is easily accessible being a short tram ride from the conference venue. It is within a short walk of the Orwell Terrace halls of residence. Delegates will need to make their own way to Murrayfield. The dinner is on June 20, starting at 19:00, ending by 00:00. Conference registration includes one dinner ticket. Extra tickets can be purchased during the registration process. Drinks will be available for purchase at the venue, where there is a cash bar. Information on travelling to the stadium can be found here.